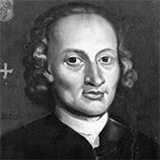 Pachelbel's Canon (a. k. a. Canon in D and Canon in D major) is Johann Pachelbel’s most famous piece. Its full German title is “Kanon und Gigue in D-Dur für drei Violinen und Basso Continuo”. The piece is not strictly speaking a Canon (as the opening bass line is not strictly copied) but a passacaglia. The piece consists of a two bar (eight note) bas line, which is repeated over and over. In a string quartet setting this part would be played by the cellist. The piece is therefore not the most popular piece amongst cellists. Unfortunately for them Pachelbel's Canon in D is one of the most requested wedding tunes. Strangely enough the work was widely unknown until the 1970s, when a recording by Stuttgart Chamber Orchestra is thought to have made it famous. The bass line and harmony of Pachelbel's Canon in D are so appealing that it can be found - either by imitation or accidentally - in hundreds of other pieces, including: The Streets of London, All Together Now, Don’t Look Back In Anger and Jolly Old St Nicholas. Level 3.5 is very close to the original. Level 3 does not have the tricky semiquavers of the middle section. Level 2.5 does not have the octaves in the left hand of the middle section (you can hear the difference in the playback). Level 2 is once again shorter by one section and the left hand consists of single notes throughout. Level 1.5 is in the easier key of C major, and the melody does not use the quavers of the previous Levels. In the box below you will be able to preview our String Quartet arrangements of Canon In D. The individual instrumental parts are included in the purchase of the full score of Canon In D. You will be able to preview the individual parts of the arrangement as well as the full score.